Israel’s Iron Dome missile defense system intercepted more than 400 rockets targeted at densely-populated locations in Israel, accounting for an 85 percent success rate, Defense Secretary Leon Panetta said Thursday. According to the American Forces Press Service, Panetta said the U.S. contributed $70 million for the system in fiscal year 2012, in addition to the $205 million it already has given. 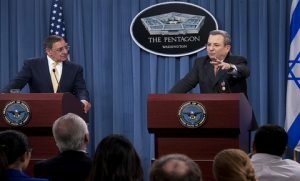 Panetta and Ehud Barak, Israel’s defense minister, addressed reporters at the Pentagon on the Iron Dome’s performance during the recent rocket attacks in Gaza, Jim Garamone writes. The New York Times reports the tactical-range system is designed to intercept rockets and missiles within 50 miles of range. Panetta visited an Iron Dome unit located in southern Israel over the summer and has promised the Pentagon would seek additional funds for the Iron Dome, Thom Shanker writes. In March, reports surfaced that the Pentagon would seek $500 million to purchase Iron Dome rockets and short-range missile intercepting batteries.